The prize here is most certainly brown tourmaline, or root beer tourmaline to many. Individual crystals can be large and undamaged faces/terminations can be simply dazzling. Fortunately, the brown tourmaline is not hard to find; unfortunately, pieces with multiple undamaged faces are not common, and those with excellent and full terminations are even rarer. But once you have navigated the cow-trodden, rutted trail to the site (ask Linda about her experience with this), collecting is rather easy. You sit, you dig, you examine. If you are not totally dirty by the day’s end, you have not tried hard enough and you probably do not have much to show for your effort. 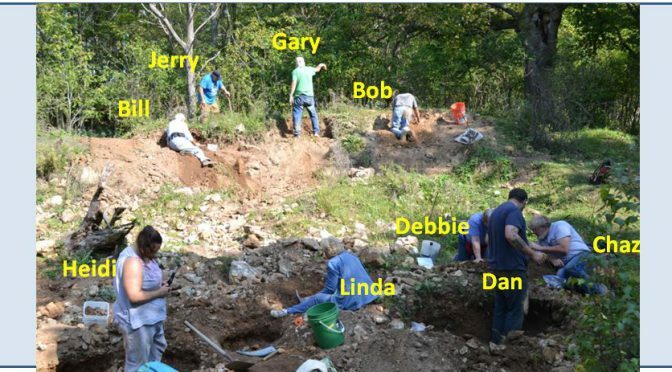 The upper tier of folks in the feature picture, led there by Jerry Curcio, are clearing soil and rocks off the edge of the larger of the open pits in search of tourmalines that may have been left on the pit rim during original collecting. Be forewarned, Gary will probably show you his prize find from this location ten times this winter! Meanwhile, the rest of us have taken stations inside the pit digging into the loose rubble that has likely been turned over by many before us. It may just be that we were sane enough to stay out of the sun. Both techniques worked, or they didn’t work, depending on one’s perception of success. However, we did all find tourmaline. Incidentally, my hole is the one between Heidi and Linda and left of the green bucket. 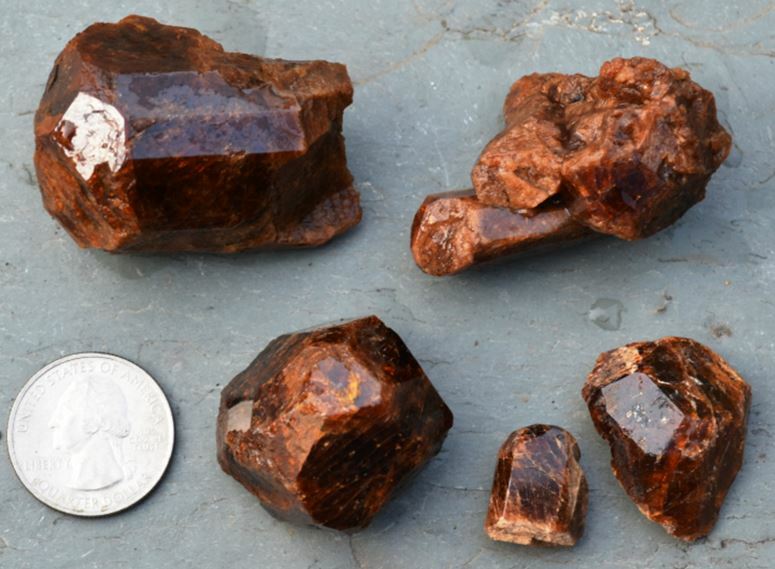 Here are a few of the partially complete brown tourmalines I gathered from my hole in the foreground of the feature picture above. I am particularly pleased by the fully terminated single crystal immediately right of the quarter. All of the complex faces of a ditrigonal pyramidal crystal are on display. Too bad the long dimension is broken. Compositionally, the tourmaline at Bush Farm is generally fluor-uvite, with calcium dominating the octahedral site in the complex borosilicate lattice structure, but there is often enough sodium in that site to cast doubt that all tourmaline from the location is fluor-uvite. Unfortunately, color alone is simply not diagnostic. One simple solution is to label your specimens from this location “brown tourmaline” unless you are fortunate enough to have an electron microprobe in your basement. There is a second mineral worthy of collecting at Bush Farm. Brilliantly white, and often verging on gemmy, tremolite is ubiquitous. 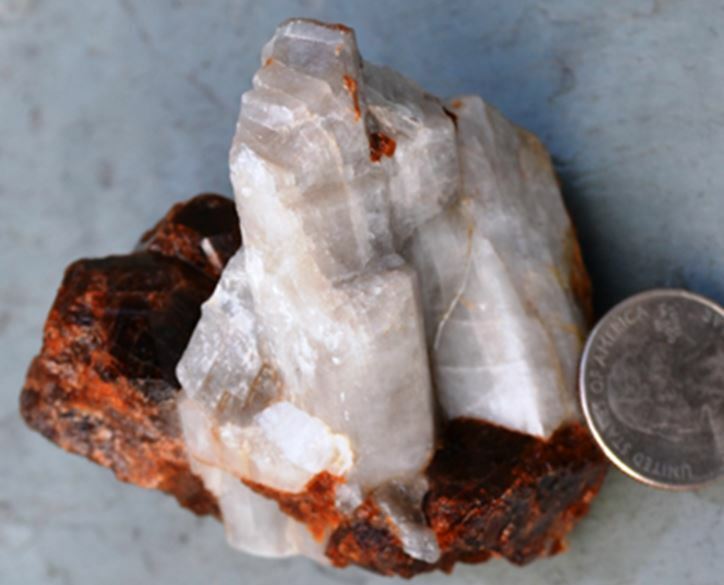 These crystals are far more likely to be fully terminated, and often are embedded in calcite that can be chemically removed. Most of us rounded out our collecting by placing some tremolite into our buckets. Much of that will require iron out treatment to remove rust stains caused by oxidation of pyrite. Often the tourmaline and tremolite grow together into combination pieces. The tourmalines on this piece are damaged, but the tremolites are complete as they rest on a base of brown tourmaline. The mineralization occurs in small pits within the Bush Farm pasture and like many St. Lawrence County mineral sites, the exposures are not adequate to fully appreciate the local geology or the origin of the mineralization. However, the immediate region is dominated by marbles and calc-silicate metamorphic rocks; the Gardenscape Inc. Seavey Road marble quarry is less than two miles east of Bush Farm. Lacking local granitic rocks, it has been speculated that the boron required for tourmaline may actually have a sedimentary origin before being remobilized into the tourmaline during regional metamorphism (Chamberlain and Robinson, 2013). Chamberlain, S. C. and Robinson, G. W., 2013, The Collector’s Guide to the Mineral of New York State, Schiffer Publ., 96 -. Lauf, R. J., 2011, Collector’s Guide to the Tourmaline Group, Schiffer Publ., 93 p.
Hi, I’m a NYC resident working for a Stone Supplier. I have some questions about these quarries and what stone is geologically local to the New York area. I would love your help with this. Generally, we’re looking for tiles or slabs of these materials, but I wouldn’t mind reaching out to each of these places to see if they can cut pieces of stone this large. I would love your help! Monika, A little confused by your inquiry. You’ve attached it to the Bush Farm Tourmaline post. There is no quarry there. The site is a small pit in the middle of a cow pasture on a farm near Richville, NY (north of Gouverneur). The owner allows mineral clubs to for $5/day/person and you can take what you find. Large rocks for large slabs are a) not too abundant and b) you would have to carry them 200 yards or so to the vehicle. We do visit a few locations that are quarries, but I’m not sure they would make for nice tiles. The limestone quarries of western NY host vugs with fluorite and calcite, but the host rock is just a fine-grained limestone. There is a marble quarry in Gouverneur and perhaps you could get a nice dark slab of garnet-bearing gneiss from Benson Mines in Star Lake or from Barton Mines, but without really knowing what you are seeking it is hard to offer suggestions.